If you will cease trusting in what you can do for God and trust in Christ as your substitute, His record will become your record. 1. He will come into your life by the Holy Spirit and give you a divine nature. "Whereby are given unto us exceeding great and precious promises: that by these ye might be partakers of the divine nature, having escaped the corruption that is in the world through lust" (II Peter 1:4). 2. He will forgive all of your sins. "In whom we have redemption through his blood, the forgiveness of sins, according to the riches of his grace" (Ephesians 1:7). 3. He will give you His perfect righteousness. "For he hath made him to be sin for us, who knew no sin; that we might be made the righteousness of God in him" (II Corinthians 5:21). "For Christ is the end of the law for righteousness to everyone that believeth" (Romans 10:4). Illustration (moving from one chair [works] to another chair [Christ]. Illustration (man rowing a boat). 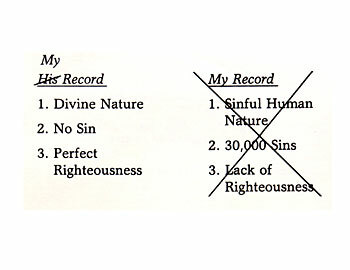 When you receive Christ, His record becomes your record, you become a child of God and God gives you eternal life. However, you must receive Him! "For the wages of sin is death; but the gift of God is eternal life though Jesus Christ our Lord" (Romans 6:23). Illustration ($10 gift in the New Testament). 1. Yes, God, I am a sinner and have sinned many times. 2. Yes, God, I lack righteousness, I am not perfect. 3. I know I am separated from You and that I would go to hell if I died now. 4. I know my good works won't save me. 5. I know I must turn from my way and go God's way. Are you willing to admit this to yourself and to God?